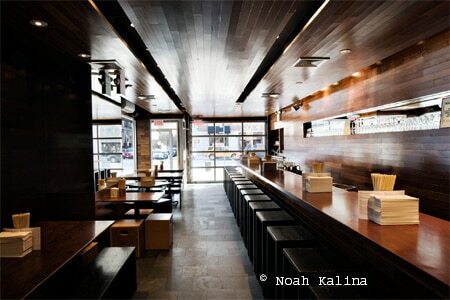 Trendy East Village eatery serves meaty Asian fare. : The tipping point in the David Chang empire, where he went from proselytizer of pork to full-fledged phenomenon, Momofuku Ssäm Bar is a delight for foodies and the adventurous alike. With limited seating --- most of the spots are at stools along the dark, sleek bar that peers into the kitchen, though there are a few tables --- prepare to wait late into the evening to sample the cuisine here. Though the Ssäm bar was initially a spot for Korean burritos (ssäm), a more expansive late-night menu emerged. 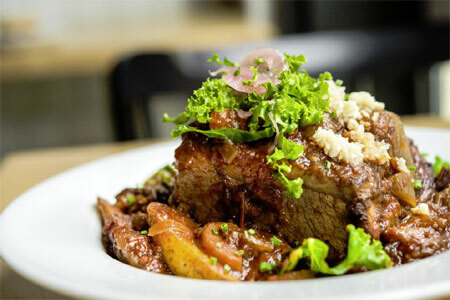 Selections rotate seasonally, though you can reasonably expect to find meat and offal-heavy dishes alongside pickled bits and a few build-it-yourself ssäm as entrées. For starters, selections range from a barbecue rib sandwich to the Fuji apple kimchi with Burgers’ smoked jowl, maple labne and arugula. Entrées like bouchot mussels with Chinese sausage focaccia, nigori broth and mustard greens are clever, and certainly unlike anything found elsewhere. The fare is representative of the Chang approach: take a solid, if unappreciated ingredient, do it justice without making it too frilly, and wait for the crowds to arrive with mouths (and wallets) open. Who can argue when the results are this good?